It's Memorial Day everyone! I hope you're enjoying your day off. I'll be here chilling, mowing, playing Legos, coloring, cooking and whatever else comes along, but let's talk the Nosh Show and Milksplash before I wander off. Cookies 'N Cream MilkSplash.... He looks innocent enough. So, episode 30 of the Nosh Show was taped a little earlier then usual, so there's not a ton of follow up. We then delve in Nosh or Nots as always, and then chew on some test market chit chat for a bit. Finally, we wrap up with NOTS of the week. Why Nots? Well, because I needed to warn the world about something. Several episodes ago, we talked about Cereal Milk and if it was worthy of our money. 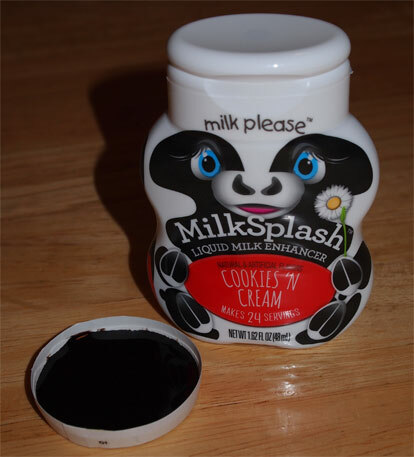 Somewhere along the line (most likely during a spotted on shelves post), I learned of MilkSplash, a liquid milk enhancer that adds zero calories. There are several flavors but since they are almost $4 a pop (even at Walmart), I decided to just try one of the flavors. I grabbed a cup of milk, squirted in way too much of this stuff, and took a swig of the most disgusting stuff I've had in a long time. Hoping I had just put in too much, I dumped out most of the mixture, then replaced it with plain milk (so it's now at about 20% of the strength it was) and it was still disgusting. You know how water enhancers have that ultra slimy, chemical texture to them? Yeah, that's here front and center. The problem is the milk seems to amplify that weirdness and take it up about 37 notches. I'm repulsed just thinking of trying it again. On Second Scoop: Ok, to be fair, I just tried it one more time. I took a small 3oz dixie cups and literally put in just a few drops of the stuff (turned the milk a very light brown). I still taste chemicals... so many chemicals. I did manage to sip the whole thing down, but there's still a lingering chemical aftertaste. I'd feel guilty buying this for my kids (though I did say my daughter could try it if she wanted but she refused after remembering my expression from the last time)... I need to go eat something to get rid of this taste. Ingredients (since they don't post them): Water, Propylene Glycol, Caramel Color with Sulfites, Natural and Artificial Flavor, Sugar (not enough to add calories), Sodium Citrate, Sucralose, Acesulfame Potassium, Citric Acid, and Potassium Sorbate (Preservative). I would never get this type of liquid water flavor mix. If I want to flavor milk I just simply add Hershey syrup or just juice up some berries add milk. What is that brown circle? Is that the product itself? I just bought the strawberry, cookies and cream, and chocolate ones not too long ago. I think the strawberry one tastes a lot like strawberry milk which I liked. I didn't try the chocolate or the cookies and cream one. I highly suggest that you measure the liquid enhancer with a 1/2 teaspoon for each 8 fluid ounces instead of squirting directly into the cup of milk due to the risk of using too much. @stride: HA! Didn't I learn that the hard way? Even still, on the second try, I still had major trouble with the texture (they do have 20k fans on facebook, so I do it's enjoyed by some). Check back when you try the others. I am actually enjoying Milksplash myself. I agree about the measuring thing: In milk, when measured, it tastes like you've just soaked a bunch of oreos in milk but you have to use enough. I've been drinking kefir, but I cannot down a glass of what tastes like liquid sour cream without something. You get just enough tart and still get the sweet with that stuff.